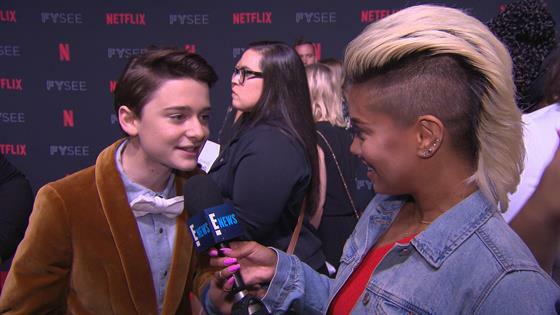 Stranger Things Star Noah Schnapp Teases Season 3 As "Amazing" and "Better Than One and Two"
If you weren't excited about Stranger Things season three, perhaps what Noah Schnapp told E! News will change your mind. "Season three, honestly, it's, like, amazing," Schnapp told E! News' Sibley Scoles at Netflix's FYSee event. "I think it's better than one and two." Schnapp, who plays Will Byers on the series, said he's read four scripts for the new season and writers at work crafting the remainder. The cast and crew recently returned to work on the sci-fi series and announced the new and returning cast members. Returning alongside Schnapp are Millie Bobby Brown, Gaten Matarazzo, Finn Wolfhard, Caleb McLaughlin, Winona Ryder, David Harbour, Natalia Dyer, Charlie Heaton, Joe Keery, Dacre Montgomery and Sadie Sink. Season three will also include an expanded role for Priah Ferguson, who plays Erica, Lucas' younger sister, and newcomers to the series Cary Elwes of The Princess Bride fame, Jake Busey and Maya Hawke. Look for Elwes to play Mayor Kline, a "classic 80s politician" who is more concerned with his public image than the city he governs (Hawkins), Busey is playing a journalist with questionable morals and Hawke is Robin, an alternative girl who is looking for more excitement in her life. Meanwhile, Ferguson's Erica will have her own wild mission as the town faces a new threat. "It's really good," Schnapp said. Will viewers be shocked by the third season? Click play on the video above to hear what Schnapp had to say. No premiere date for Stranger Things season three has been announced yet.